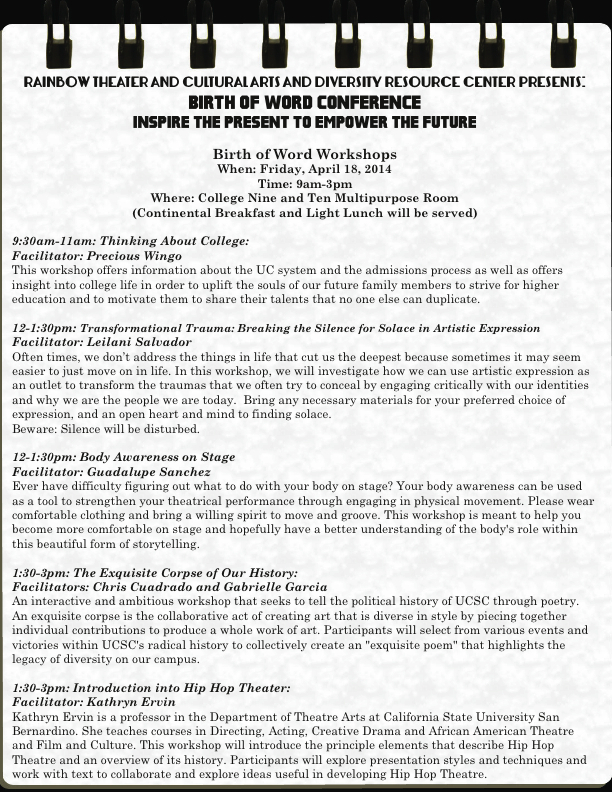 The objective this year for Birth of Word’s 8th season is to take it back to the ideas of its original conception. This year is Rainbow Theater’s 20th year anniversary that it has been an expressive, healing, and transformative community space. And since the creation of Poet’s Corner, the leaders from that particular cast decided to create a celebration of art and expression through a festival format where everyone can share the stage and their personal story through their particular form of artistic expression. This year, the festival will focus on Rainbow Theater’s trajectory of understanding “the word” by highlighting different aspects of expression: acting, singing, poetry, and finally, dance. The goal for this year’s Birth of Word is to not only showcase the talents of our our UCSC students but to also outreach to the underrepresented youth and give them the opportunity to grow and learn outside of their own communities. Secondly, it is also a call for alumni performers to showcase what they’ve learned and what they are achieving as professionals in the theater and art world. Lastly, because it is a free and open event for everyone, UCSC students and community members alike, it gives greater opportunity for the university and the community to continue to build a stronger relationship with each other through this fun and lively event, which in both spirit and decoration will resemble that of a family reunion. 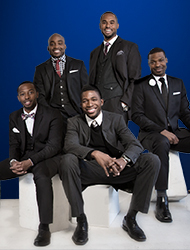 Fiveology is a highly awarded spoken word poetry collective comprised of five very talented, passionate and internationally recognized artists. A dynamic and entertaining performance poetry collective, Fiveology is comprised of Rudy Francisco (National Slam Champion, Lexus Verses and Flow), Javon Johnson, Ph.D. (2 time National Slam Champion, HBO Def Poetry and Lexus Verses and Flow seasons 1,2 & 3), Prentice Powell (National Slam Finalist, Lexus Verses and Flow seasons 1,2 & 3) Andrew Tyree (Slam Champion, Lexus Verses and Flow seasons 1 & 2 and Accomplished Actor) & Shawn William (National Slam Finalist, Lexus Verses and Flow Season 3 & Showtime at the Apollo). Formed in the fall of 2012, Fiveology toured nationally opening up for 3 time Grammy award winning Jill Scott, the group performed at McDonald’s 365Black Award Show at the Essence Festival honoring Dr. Steve Perry (Save Our Sons) sharing the stage with Jordin Sparks, Yolanda Adams & Angie Stone that will appear on BET this fall and will also feature on the upcoming 3rd season of Lexus Verses and Flow.